If there’s one thing I’ve learned in my years of tech reporting it’s that you should never say Bose makes good products. Bose, like Apple, is a lightning rod for informed and uninformed attacks from both the pro and con camps and to say they do things well – or poorly – is a dangerous proposition. That said, I’m here to tell you that if you travel a lot then you should get the QuietComfort 15 headphones. I tested these headphones during three long overseas flights. I’ve been a fan of the QuietComforts for a few years now and always wore the QC3s, the smaller version of the original QuietComfort headphones. However, the noise reduction built into the new model is quite staggering. In an airplane cabin turning these headphones on and off shows you how effectual they are. Instead of the steady, buzzing hum of the airplane you hear silence. The music and audio quality are also excellent. I’ve tested a few headphones in my day and I’ve always gone back to Bose. This model takes one AAA battery which lasts 35 hours, give or take. It has a removable cable and is large enough to cover the average pair of ears. 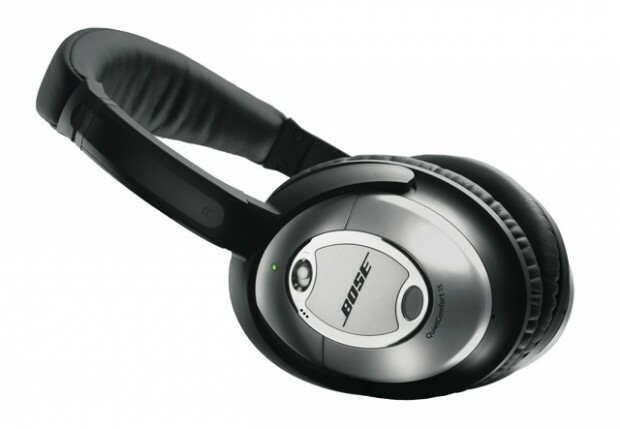 Compared to the QC2 the QC15 noise canceling is strikingly more effective. This is an important point and it may be worth going ahead with the upgrade. Compared with other noise-canceling models I’ve tried I’d say these are the best. Now for the caveats: when the headphones are out of juice, they’re useless. They don’t just pass through the audio. Instead, if the circuitry is off, the headphones are off. This is a huge issue if you run out of battery half-way to Djibouti but has yet to happen to me with either the QC3s or the QC15s. Thankfully this model takes standard batteries. The other caveat is the price. $299.95 is pretty steep for headphones while other noise canceling models cost a third of that. Considering the QC3s are $349, however, it’s not too bad. Bose is a hard nut to crack. They make great noise canceling headphones but I think most audiophiles bristle at their various claims of audio quality, especially in some of their higher-end audio systems. I’m not music nut but I have found the QC3s – and now the QC15s – to be faithful to the source without too much bass and the comfort and noise-canceling seal the deal. If you travel, give them a try.